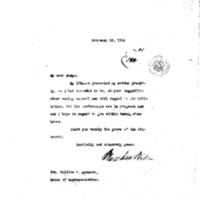 Woodrow Wilson writes to William C. Adamson about the tolls matter. My illness prevented my acting promptly, as I had intended to do, on your suggestion about seeing several men with regard to the tolls matter, but the conferences are in progress now and I hope to report to you within twenty–four hours. Thank you warmly for yours of the sixteenth. Wilson, Woodrow, 1856-1924, “Woodrow Wilson to William C. Adamson,” 1914 February 18, WWP18359, First Year Wilson Papers, Woodrow Wilson Presidential Library & Museum, Staunton, Virginia.